Because of the sensitivity of acid, marble floors must be cleaned with alkaline cleaning solution. We’re extremely careful not to get your marble stoned floors too wet, if your floors are too wet flooding or waterlogging can occur. It’s important to us because using soap and water can cause damage to your floors by going to deep in the surface. Like every natural stone floor, they must be cleaned regularly to prevent erosion. Cleaning marble floors require the use of special equipment, tools, chemicals, sealers and protectants to stop etching, scratches and staining to your floors. Modern Stone Care are the professionals with the expertise to have your marble floors looking brand new with our superior cleaning service. We only use cleaners that are pH, acid-free and concentrated. Acid solutions can etch the floor surface if not properly cleaned and care for. We avoid using any forms of creams, alkaline products or scouring powders because of small abrasives that in these chemicals can scratch the surface of marble. 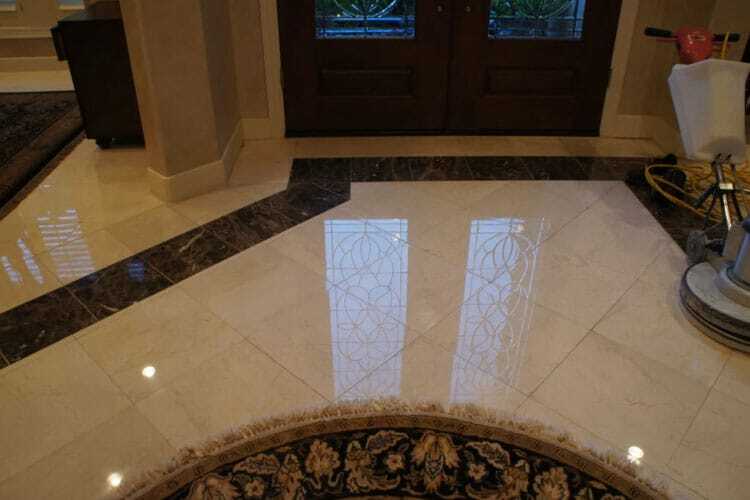 Remember marble is a stone with holes that can absorb a stain quickly, it is best to have it cleaned in a timely manner because the longer the stain stays the harder it is to have it remove along with the fact it will make your floors worn and old. Modern Stone Care is your best option for high level cleaning of marble floors. Our company has the experience technicians who have the knowledge on using the proper cleaning process to carefully remove and debris from the surface leaving your floors to look fresh and new. After we clean your marble floors we buffer them to bring a shine and enhance the surface of your marble. We never let marble dry naturally because this will form water marks. Find out more about our marble floor cleaning service and how we can improve your home appearance with regular floor maintenance. Not only will your floors look elegant and beautiful now but will increase value of your home from years to come. Contact the professional marble specialist at Modern Stone Care.